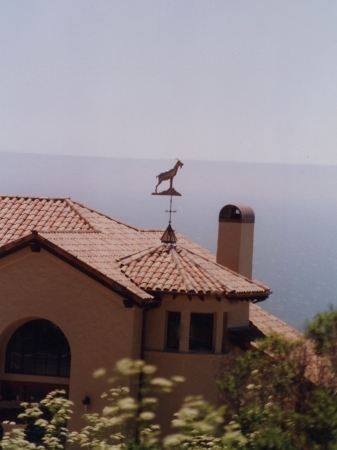 This Alpine Buck Goat Weathervane was commissioned by neighbors with a large herd. The Alpine Buck portrayed has very interesting Broken Chamoise markings depicted through careful application of gold and palladium leaf. Leafing is an optional extra, and cost depends on the extent covered, and current price of the precious metals. Our customer came to the studio and assisted in the design process, bringing her deep knowledge of goats, their classic looks and behaviors. 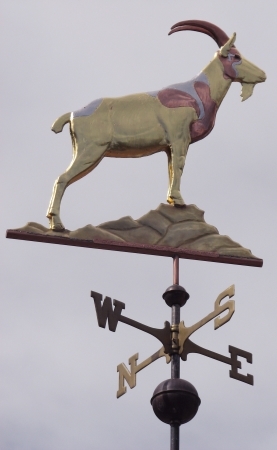 He is fabricated in copper of the swell body style, and the rocky outcropping beneath his hooves, in a natural goat stance, is crafted in brass. 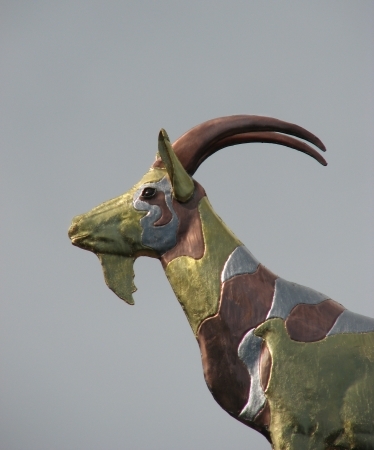 The goat has realistic looking glass eyes. For a more stylized look we have a nice selection of glass eye colors. Collars with tags and inscriptions are other options for a this piece. 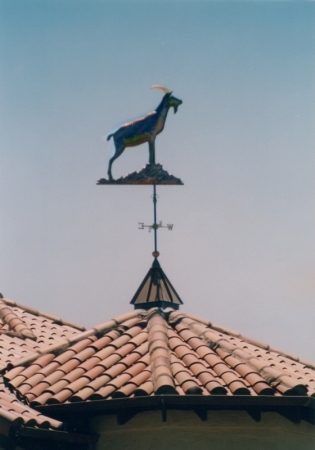 Alpine Goats now live throughout the world due to their sturdiness and excellent milk production. The proteins and fats of their milk are high quality and it is a very desirable source for cheeses and butter. 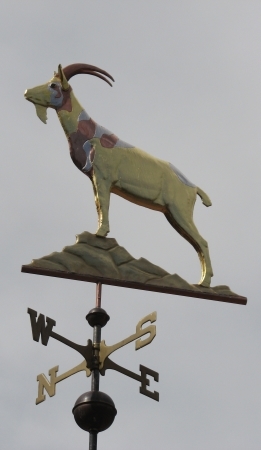 The markings on Alpine goats are of such interest and distinction they have been named. And interesting names they are! In addition to the Chamoisees – Two-Tone, Broken and Original, there are the Cous – Blanc, Clair and Noir, the Pied, and the Sundgau.